When they hear the English word “sweet potato”, most Japanese people think of this dessert rather than the sweet potato as a vegetable. My mom makes this dessert every autumn, and she gave us some pieces last weekend. For a long time, I thought this was a western dessert and didn’t know that it was invebted by a Japanese patissier in Tokyo during the Meiji era. Today it’s sold in many confectionary stores nationwide and widely cooked at home as well. 300g Japanese sweet potatoes. 30g butter. 1 egg yoak (1/2 to mix with sweet potatoes, 1/2 for the surface). 3 tbsp sugar. 2-3 tbsp milk (or fresh cream), 1 tbsp whiskey (or rum). Microwave (or steam) sweet potatoes until soft to peel, mash and strain. Add butter, sugar while the sweet potatoes are hot and mix well. Then add egg yolk, milk and whisky. Mix further. 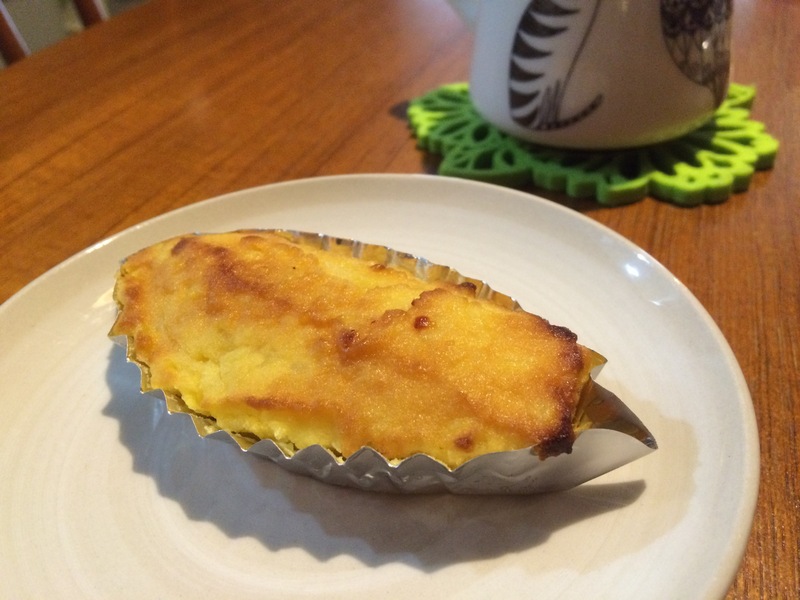 Put this sweet potato cream in foil cups, brush some egg yolk on the surface. Bake in the preheated oven (200°C) until browned.